You could say I am being lazy but I like to think I am just being really relaxed today. 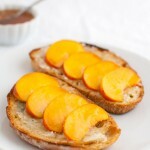 The recipe for this grilled crostini with peaches, blue cheese, and honey will hardly seem like a recipe at all. But that’s the point – use it as a guide. It is meant to be casual. My kids start school in a week so I am trying to savor the last week of summer vacation before the crazy schedule of school and activities begins. There will be swim practices, dance practices, PTO meetings, sporting events, homework, etc. No more slightly late dinners because I felt like lingering over a book or on the computer. But until all that craziness starts up, I want to hold on to the slower pace of summer for just a little while longer. This grilled crostini will fit in nicely. The night I served this, I also set out several cheeses, some fruit, and various sliced meats from the deli like salami, prosciutto, and roast beef. We grilled extra bread and everyone just put together their own combinations. The meal was relaxed and relaxing. Kinda the way life should be. Brush both sides of the bread slices with olive oil. Put bread on the grill and cook until nicely toasted on both sides. Spread blue cheese on the grilled bread and top with peach slices. Drizzle with honey and serve. To make garlic infused olive oil, put 1/2 cup olive oil and 2-3 crushed garlic cloves in a small saucepan. Warm the olive oil over low heat just until it begins to simmer. Remove from heat and let stand 4-8 minutes (the longer you let it stand the stronger the garlic flavor will be). Then remove and discard the garlic cloves and brush oil on bread. Recipe adapted from Bon Appétit, August 2014. Thank you Thea. I have never been a big blue cheese fan but this recipe changed my mind. I was with you until you said to throw out the garlic cloves… Heresy! 🙂 That is garlic confit right there… mash it up with a little salt and serve it on the side with the rest of your spread… By the way, I showed the website to Amy and she was very impressed. But peaches and blue cheese with honey is right up my alley. You are so right! I should have thought to mash the garlic to spread on the crostini. We definitely need to share more cooking notes.